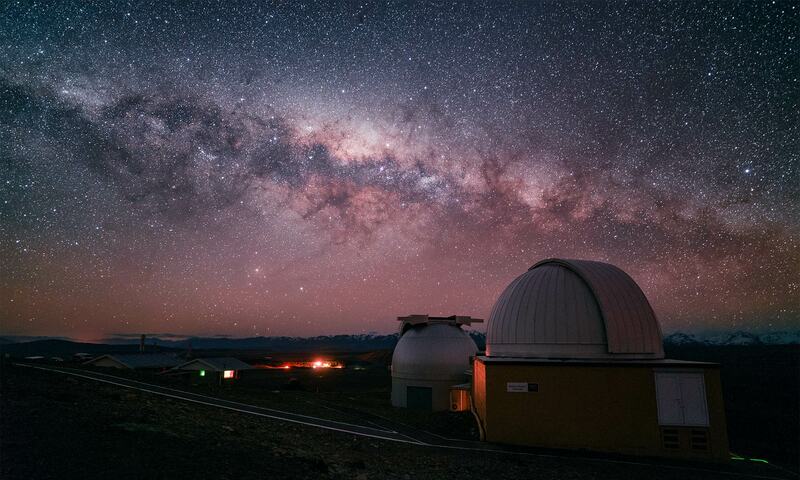 Astrophotography in its simplest form is increasing in accessibility, especially with today’s affordable, large sensor, high signal-to-noise ratio digital cameras. In my opinion, there are few photographs that have as much existential impact as a nighttime landscape against the Milky Way. Here, I will show you how to make an amazing photo of the Milky Way Galaxy with a minimum of effort and a minimum of equipment. There are a few things that you will need. Here is a concise checklist of some of the most helpful things. Also check out my article on putting together your Beginner Astrophotography Kit. It is a common misconception that you need an expensive camera and lens combination to make a great Milky Way photograph. Pretty much any Digital SLR (DSLR) or camera with a Micro 4/3 sensor or larger is more than capable of photographing the Milky Way, especially when paired with the right lens. 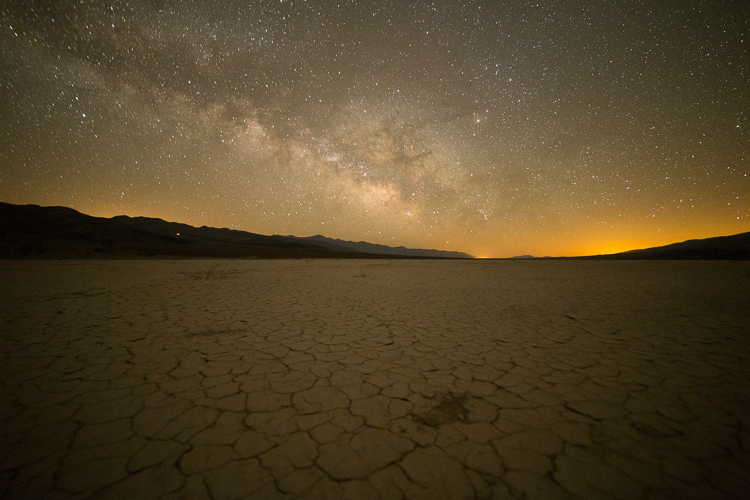 You don’t need an expensive full frame camera like this Sony a7S to photograph the Milky Way. It helps, but it’s not necessary. In fact, I’ve spent a lot of time testing the capability of certain point and shoot cameras and even certain smartphones that can photograph the Milky Way. 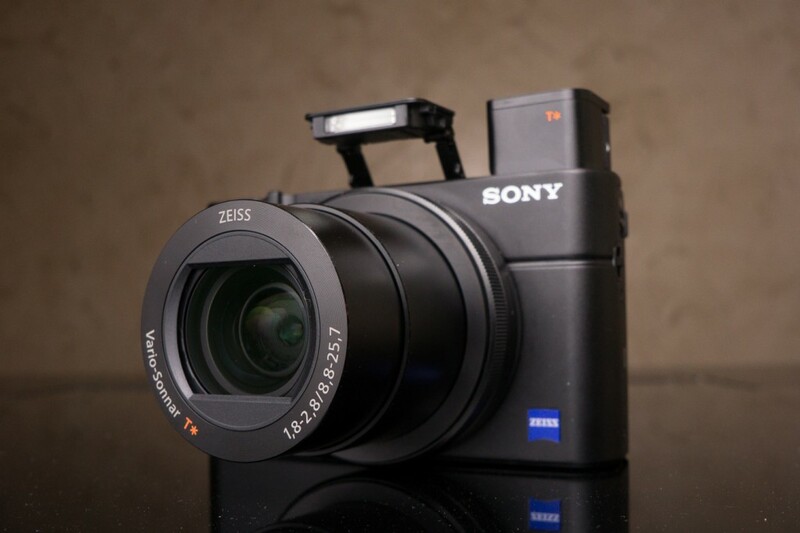 One of my favorite backup cameras is actually the Sony RX100III, a relatively small, but high performance, point-and-shoot camera. The Sony a7S, more than any other camera currently available on the market, is my absolute favorite camera for night photography. It’s sensor, while only 12 megapixels, is particularly good in low-light and that makes shooting the Milky Way super easy. 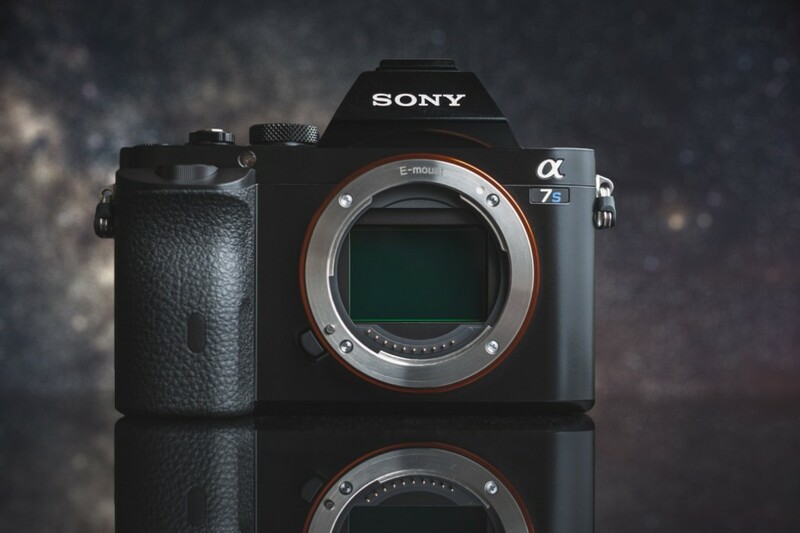 Check out my full review of the Sony a7S here. All told, don’t get too hung up on what camera to use. The above ones are some of my favorite but almost any budget friendly digital SLR is capable of shooting the Milky Way and it’s likely that the camera that you already own is worthy of trying. Let me start by saying that the kit (likely an 18-55mm f/3.5-5.6 or similar) lens that came with your camera is a fine lens to start with. If you’re just getting into trying to shot the Milky Way, stick with what you’ve got. The image below was made with the regular Canon T2i (a much older model) and the Canon 18-55mm f/3.5-5.6. I set it to 18mm and f/3.5, shot a 30 second exposure at ISO 6400 and I think the results turned out great for such a cheap lens. I am often asked the question: “I have such-and-such DSLR with the 18-55mm f/3.5-5.6 kit lens. Can I photograph the Milky Way with it?” The answer is absolutely yes! 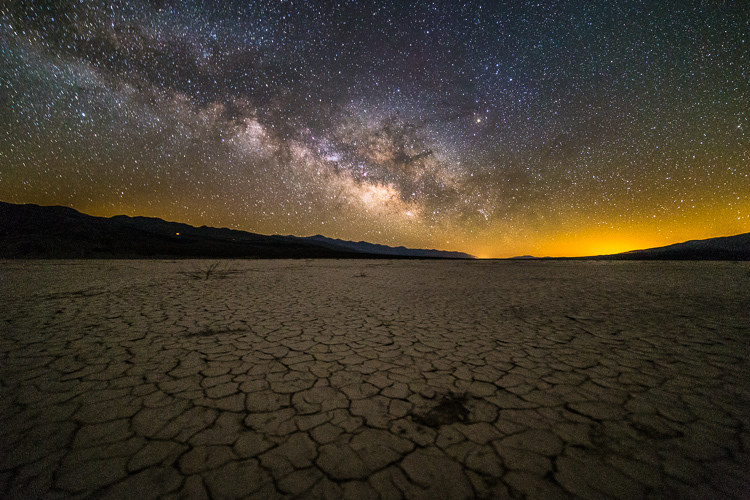 A “fast” wide angle lens will give you the best results when photographing the Milky Way. The important traits are a low aperture f/number rating and short focal length. The lower the f/number rating, the faster and better the lens will be for really dark shooting conditions. 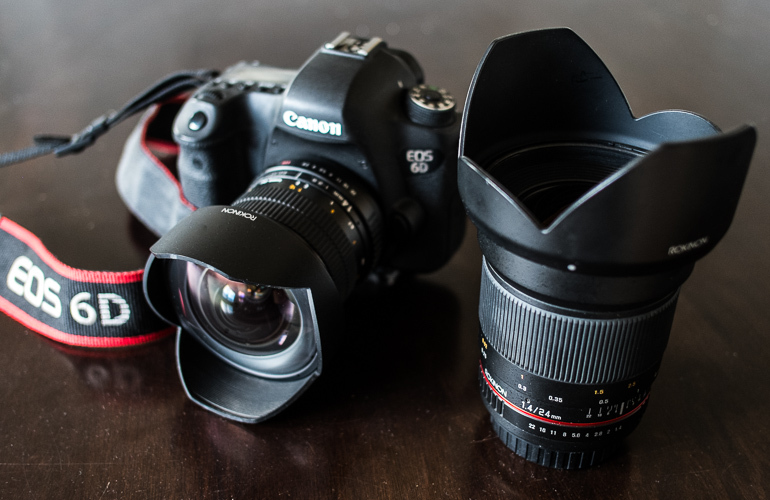 Most digital camera kits come with the ubiquitous 18-55mm f/3.5-5.6. While the minimum f/number of that lens (at 18mm) is f/3.5 is a little bit “slow” for Milky Way photography, you can still squeeze by with a slower kit lens like the common 18-55mm. 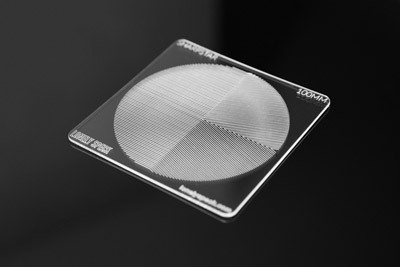 Keep in mind that you will actually see a tangible difference with a faster lens that has a lower f/number rating. Canon EOS 6D with Rokinon 14mm/2.8 and 24mm/1.4 are my absolute favorite tools for astrophotography. There’s nothing special to remember for your tripod choice, just make sure it’s stable enough for your camera and is light and compact enough that you’ll actually want to carry it around with you. It’s not very fun lugging around a heavy tripod, even if it could support an aircraft carrier. I personally use: the Sirui T-025X( Amazon )( B&H ). One recommendation I always make for photographers looking to buy a tripod is to find one with a ballhead. It’s much easier to quickly re-compose a tripod with a ballhead than one with the more video-centric pan-tilt head. 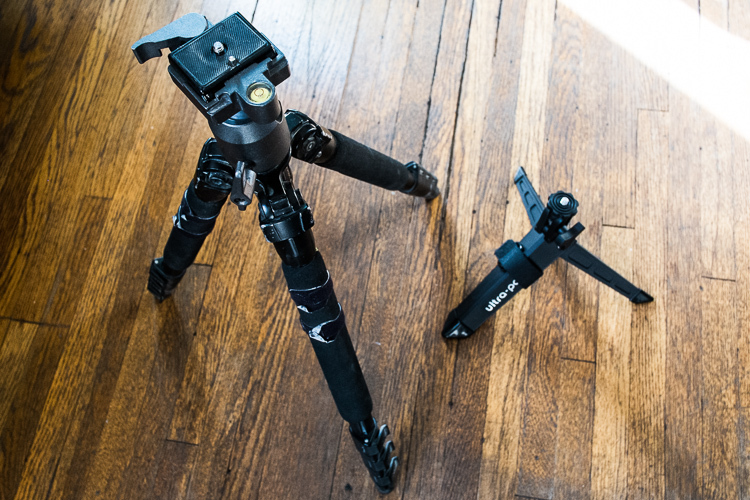 A super cheap yet high quality option for a tripod that I tend to suggest is the ultra cheap Dolica Aluminum or Dolica Carbon Fiber Tripods (Amazon). Make sure that your tripod is stable but light enough to enjoy carrying with you. Since you’ll be in the dark, a headlamp is pretty much a necessity. I think I once listed this a optional but it really isn’t. You’ll need to see in the dark so definitely make sure you have one. I prefer an LED headlamp with a red “night vision” mode. For a long time I used an older version of the Petzl Tikka XP. It can be switched to night vision mode without needing to cycle through the white lighting modes. This control scheme makes it possible to turn on and off the red mode without blinding yourself with the white mode first. Petzl headlamps are great. I’ve never had one fail on me, the batteries will last for over 7 days straight of continuous output and they do a great job of warning you when the batteries are low with a red blinking indicator. Even when they’re running out of juice, it will keep on lighting for an extended period of time at reduced output so that you aren’t left in the dark. 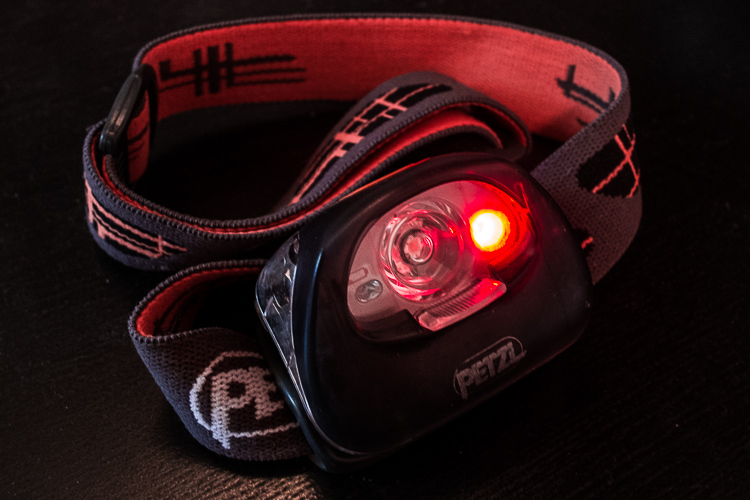 Petzl Tikka XP2 Headlamp is my personal choice. I’ve recently started recommending the newer Tikka R+ headlamp for its USB rechargeable Lithium Battery. It has all the functionality of my older XP headlamp (red night vision mode, variable brightness, waterproof, etc.) but can also be easily recharged via USB so I can keep it juiced up from a variety of power sources like my car, a lithium Battery pack, or even a solar charger. 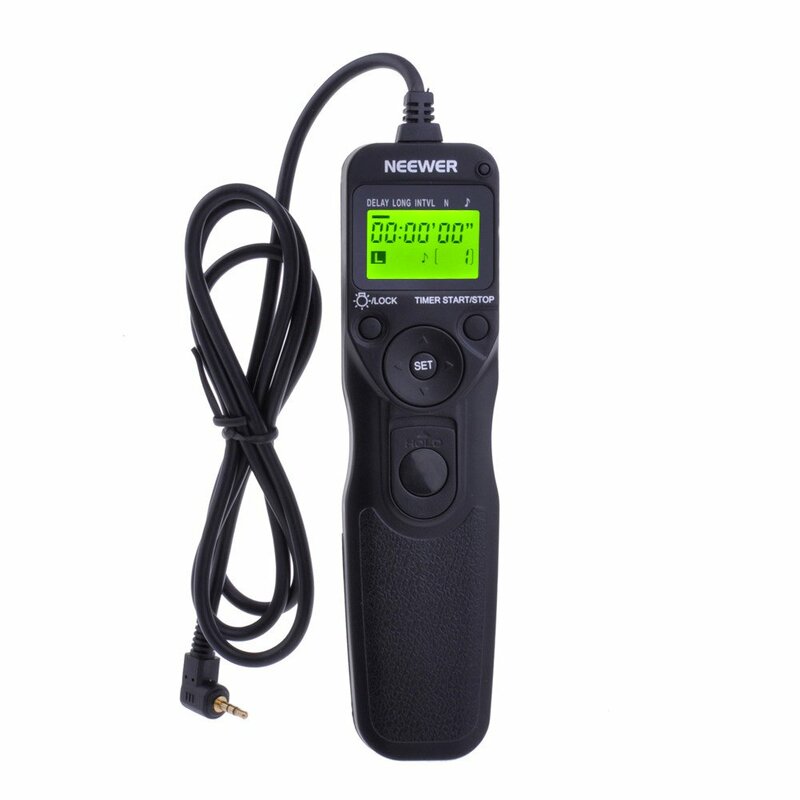 An intervalometer will allow you to trigger your camera remotely without needing to touch the camera. This is particularly nice to prevent vibration in the camera that can add blurring or streaking in your images. An intervalometer will also allow you to make timelapse sequences and allows you to program exposures longer than 30 seconds when your camera is in Bulb (B) exposure mode. From experience, I particularly recommend the Neewer Intervalometers. They’re less than $20 and have never failed me. Plus, they use AAA batteries just like the my headlamp so I don’t need to carry two different types of batteries. Check if your camera has a built-in interval timer too. Some models like the Nikon D7100 have the functionality built in which makes it great for timelapses. If you’re using a Canon EOS camera, I recommend checking out the Magic Lantern firmware hack. It will enable all kinds of extra functionality like a built-in intervalometer and programmable Bulb timer. I recommend the super cheap Neewer intervalometers. Keep in mind that there are a lot of cameras that feature built in intervalometers (a list of cameras that d0). My Sony a7S and a7II have a built in timelapse apps that allows me to make timed exposures without the need to buy an accessory. Check your camera’s manual to see if your camera has a built in intervalometer. One of the first challenges of photographing the Milky Way is knowing how to find the Milky Way in the night sky. I personally use and recommend Stellarium for Android or Sky Guide for iOS. Stellarium and Sky Guide show a map of the stars with the plane of the Milky Way in view so you can more easily figure out where to point your camera. Stellarium Mobile is my favorite star chart app for Android Phones. 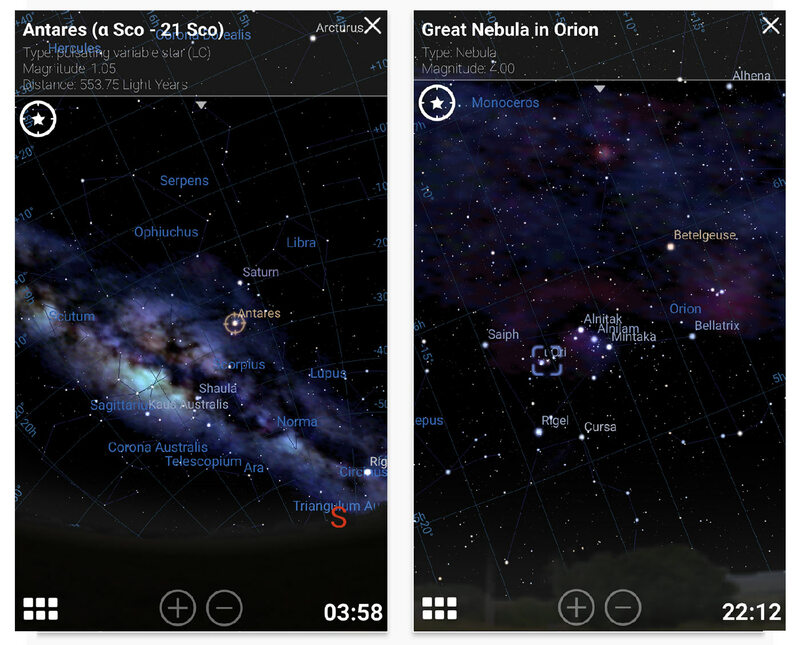 There are also a number of free applications like Google Sky Map for Android or Night Sky Lite for iOS that will help you find out where the Milky Way is in the sky at any given time of year. 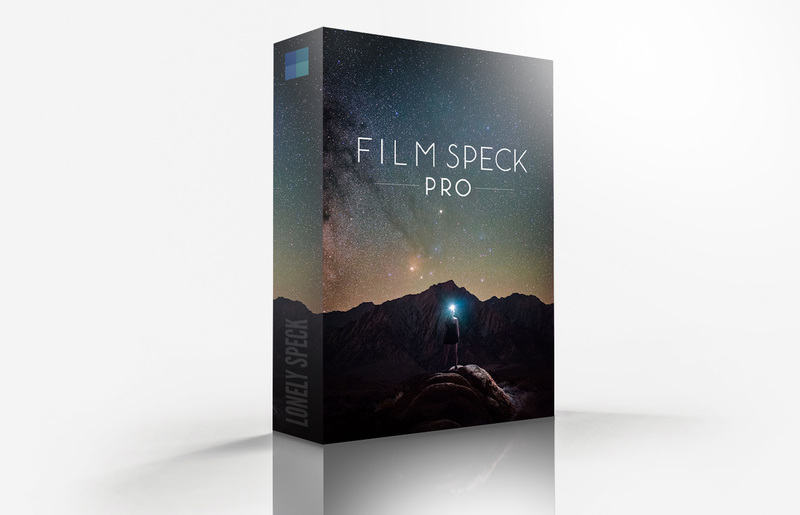 The free apps work great if you’re just starting out. Two other great photo planning applications are PhotoPills for iOS and The Photographer’s Ephemeris for Android and iOS which will allow you to plan for the phase of the moon, moonrise, moonset, sunrise and sunset. 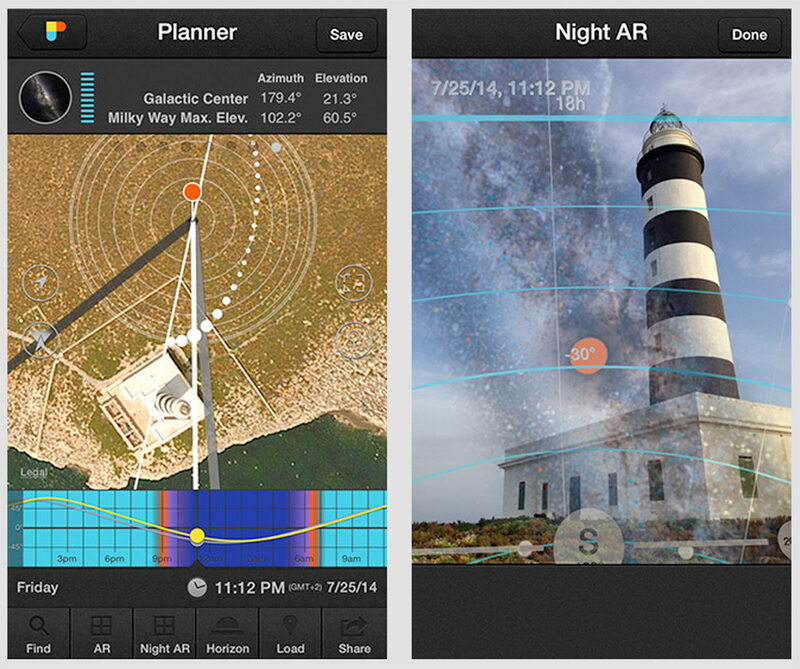 PhotoPills for iOS has one of the most complete Milky Way planners. Use the app to familiarize yourself with where those constellations are. That’s where you will be pointing your camera. If you don’t have a smartphone, I recommend checking out the free and open source software Stellarium for Mac, Linux or PC. Check out a more detailed list of tools and tips for finding the most important constellations in the night sky in my How to Find the Milky Way article. Of all the items on the list above, a dark location is probably the hardest thing to find. 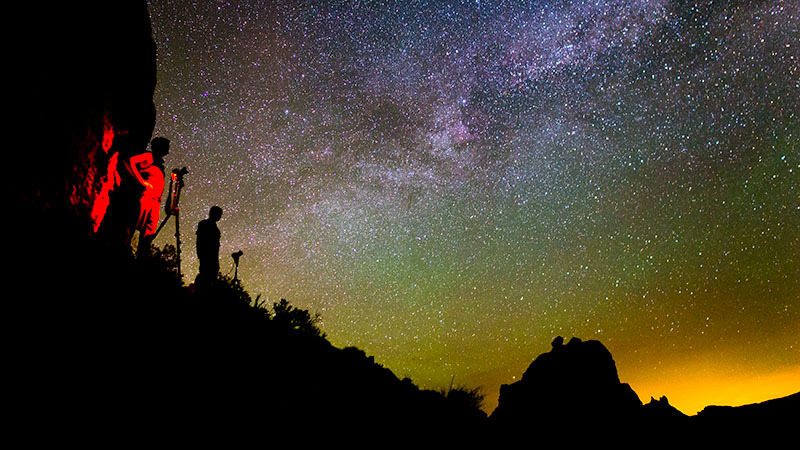 Two-thirds of the United States population are unable to see the Milky Way Galaxy due to light pollution. Unless you are lucky enough to live in a remote rural location with super dark night skies, you will probably need to make a trek out somewhere relatively remote in order to photograph the Milky Way. This is a great opportunity to explore new places. If you live in North America, check out Dark Sky Finder, or the Clear Sky Charts on cleardarksky.com. Both have light pollution maps and Clear Dark Sky has weather and seeing forecasts for locations with the darkest skies. If you live elsewhere in the world, check out Dark Site Finder, The World Atlas of Artificial Night Sky Brightness and the Blue Marble Navigator. I recommend finding publicly accessible lands like national parks and state parks as they’re often located away from cities and usually feature unique and beautiful landscapes. 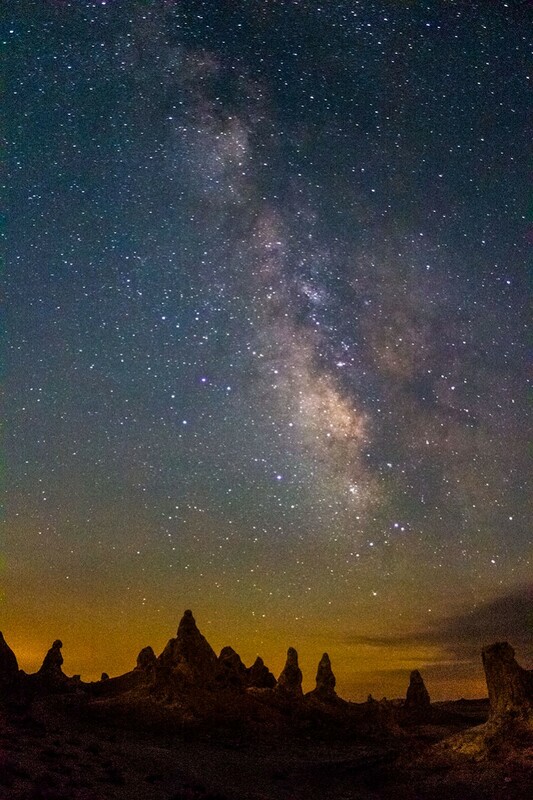 Check to make sure that your park is still open at night (most National Parks are Open 24/7). Once you pick your location, plan on venturing there some time between the last quarter and first quarter of the moon calendar, ideally during a new moon. This is not a hard rule, but the closer date to the new moon, the more time you will have during the night with dark, moonless skies. 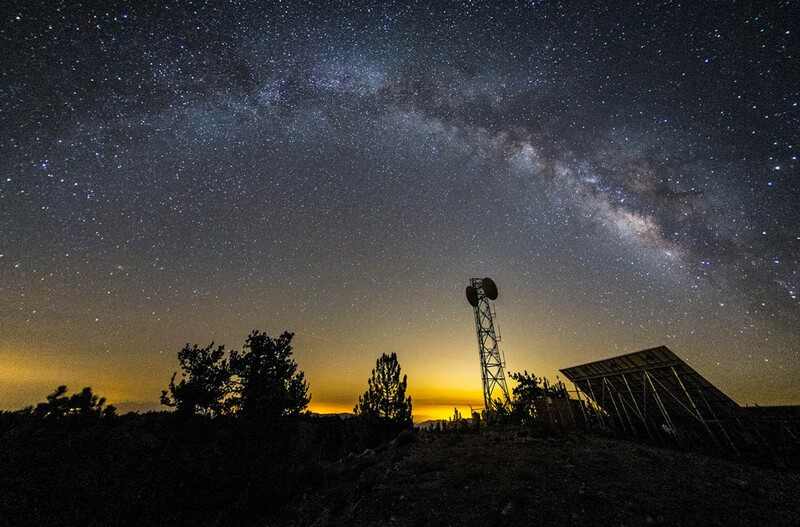 Now that you have all your equipment, are in a beautiful outdoor location with dark skies and have located the Milky Way with your smartphone app, you are ready to make a photograph. There are a number of things that you’ll need to do to make a successful exposure of the Milky Way. Here’s a checklist of what we will cover. I am going to suggest some settings that will be a good ballpark start for your exposure. You may not even have to change them for your final exposure but that will depend on things like moonlight, light pollution, your camera, and your lens. We will start here and adjust accordingly. You should be familiar with each of these settings and how to change them. If any of these settings are unfamiliar to you, review your camera’s manual for how to change the setting. RAW image files contain more data than JPEG files and thus allow for greater flexibility in post-processing adjustments. 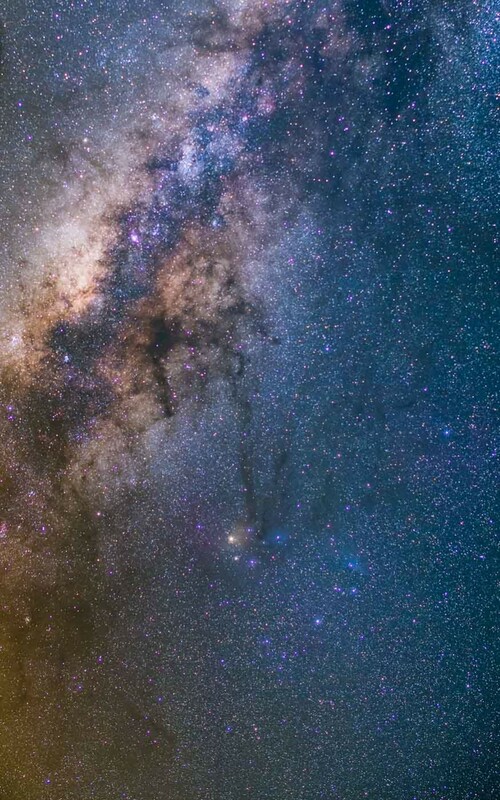 The wider field of view will reduce streaking of the stars due to Earth’s rotation and will allow us to capture as much of the Milky Way as possible. Use manual focus (M or MF) mode on your lens and set it to the infinity mark if possible. We will focus more precisely later. Enable long exposure noise reduction (optional). This will reduce grain on your photos by taking a second photograph without opening the shutter to record and subtract noise data from your image. Note that this will usually add additional wait time to each exposure before you will be able to use your camera again for the next exposure. If your camera takes particularly low noise images, such as a Canon 6D, you probably don’t need to enable this feature. Enable the histogram in the image review. This will allow us to see a graphic display of our exposure and adjust accordingly. Many things like light pollution or moonlight can change the white balance of the image so just set it to auto. Since we’re shooting in RAW, we can make adjustments to the white balance later. If you’re shooting a timelapse, a custom setting of 3900K or a setting of tungsten can prevent unexpected changes during the timelapse sequence. The exposure settings that I recommend in a dark sky area are dependent on the type of camera and lens that you are using. 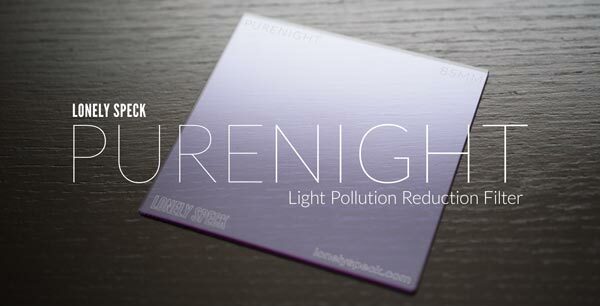 Use the calculator below to determine the exposure that I recommend you use initially. 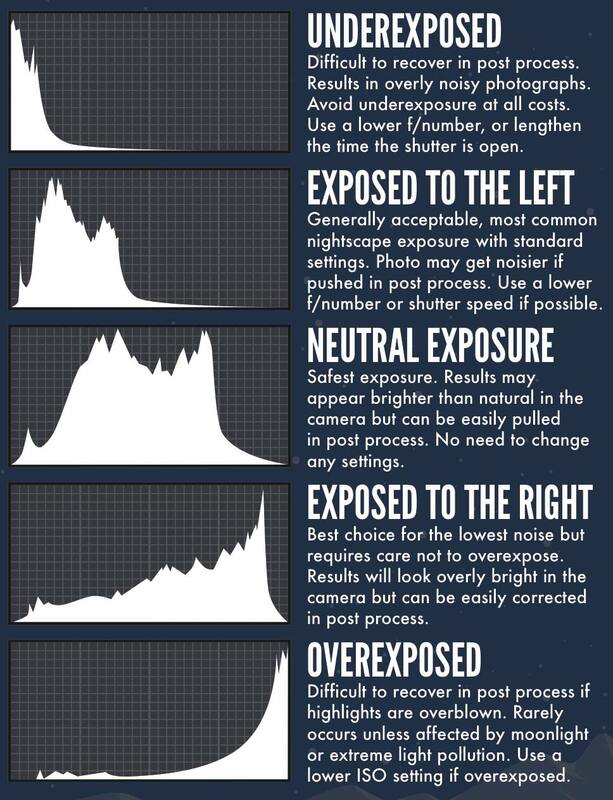 Once you take your first exposure, you can adjust as necessary based on your exposure histogram. The shutter speed is calculated based on the focal length of your lens and the size of your camera’s sensor. Longer focal lengths and smaller sensors require shorter shutter speeds to prevent star trailing. The f/number should generally be set to the lowest possible number, preferably f/2.8 or lower if your lens supports it. Lenses with f/numbers of f/4.0 or higher are not recommended. The ISO is calculated based on your aperture and shutter speed but it’s a little dependent on the noise performance of your camera. Start with the calculator’s recommendation and adjust accordingly. For a more complete explanation of how to figure out the exposure for shooting the Milky Way, visit my article on the Milky Way Exposure Calculator for a complete explanation of the calculations that are being used. I like focusing before composition because it’s generally easier to focus your camera first, tape your focus ring, and then re-compose later. In general, you will want to make sure your lens is in manual focus mode (M or MF) and is focused at infinity. But rather than just setting the focusing ring to the infinity mark (on some lenses) and forgetting about it, we will want to make more precise focus adjustments to ensure the best possible photo quality. Here are a couple methods that I use to focus in the dark. Being able to focus on a distant artificial light (like your friend’s flashlight) is very helpful when it’s dark out. This is by far the most accurate method if your camera supports it. Enable live view on your camera and use the focus checking or the digital zoom function on a bright star to make the star appear like a pinpoint. I recommend centering the star in the frame before focusing on it to have the most even focus field. Note that you may need to change the Live View settings on your camera to “exposure simulation” or “manual,” in order to be able to see stars on the LCD. If you cannot see stars in the LCD, try focusing on a flashlight at a distance like in the method below. This can be an easy way to get your camera to focus at close to infinity in the dark but can be difficult if you don’t have a helping hand to hold the flashlight for you. It’s often best to place a flashlight next to an object in your frame that is at a distance of 100 feet or greater, the farther the better but after about 150 feet or so, it makes less and less difference. Plus, walking back and forth 300 feet just to focus your camera can be a drag. As soon as you get focus confirmation on the lit object, switch the lens back to manual focus (MF) mode to lock the focus at infinity, being careful not to twist the focus ring and mess up your focusing work. A flashlight can also be helpful if you wish to instead focus on a foreground object rather than infinity. Regardless of the method of focus, make a test shot of the stars with the exposure settings above to check your focus. Zoom the LCD all the way into the image review to make sure that the stars look like pinpoints, if they are out of focus circular blobs, re-focus and check again. Always zoom the LCD into the preview review to check the focus, don’t take the initial thumbnail at face value. Once your shots are in focus, a piece of electrical tape or gaffer’s tape between the focus ring and the lens body can help prevent you from bumping the focus. The settings that you calculated above when we setup your camera should be a good start. Once you are satisfied with your focus and your framing, the next thing is optimizing your exposure. This is where we will review the camera’s histogram information (The histogram is usually available by pressing “INFO” or “Display” or Up/Down arrows when reviewing photos. It really depends on your camera so check your instruction manual.) Typically we will desire a histogram that shows peaks toward the center of the graph from left to right. See below for examples of histograms for various exposures of the Milky Way. Try to push your camera to the limits of its light gathering capability without compromising quality. Check and re-check your image review, zoom in on the LCD to check focus, review the histogram for exposure information and re-compose your frame throughout the night. Once you find an exposure you like, you can usually maintain the same exposure throughout the night. The thing to keep in mind with post processing is that less is usually more. If you push the exposure of your photograph too much in post processing, you will often increase noise levels and reduce the quality of your photograph. For this reason, make your best effort to properly expose your photographs in the camera. There isn’t one right way to process your photograph but I’ve put together a new video tutorial to walk through the complete post-processing workflow that I use on nearly every single one of my Milky Way photographs. It’s very simple and straight forward and should give you a quick way to process of all your astrophotos. That’s just about it! Even with a very limited set of tools, it’s possible to create some amazing photographs of our home galaxy. 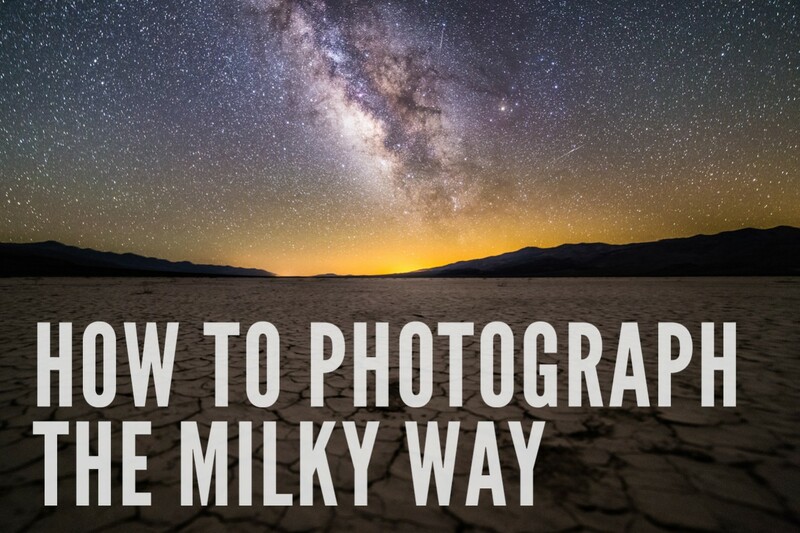 This lesson should have give you the most basic information needed to make some amazing Milky Way photographs. You have the tools, now all you need to do is let your creativity go crazy. Can I use a Sigma 50mm f/1.4 lens in a pinch until I can get a 14 or 16mm lens? The Sigma 50mm f/1.4 should work fine for your early shots John. Because of the narrower angle of view, you may need to limit yourself to shorter shutter durations. You will start to see a little bit of star trailing with shutter durations longer than about 8 seconds. If you keep the lens wide open at f/1.4, and use ISO 6400, you should be able to use these shorter shutter durations while still collecting enough light. Finally, you may also need to be more careful with your framing because the angle of view is so narrow; definitely use Stellarium or a night sky smartphone app to familiarize yourself with where you should be pointing your lens. Go out and try it out! Thank you for your reply. I’ll give it a try and see what the results are. I’ll eventually be purchasing a 14mm f/2.8 Rokinon lens as described in the article above and hopefully get longer exposure times. Yes! Check out my article on stitching. Thanks so much for this clean “checklist”. I’ve had several nights in the dark up in Kennedy Meadows in the Southern Sierras, and came home with some nice shots, including some Perseid meteors. Your set up help made it possible!!! Thank you for being so generous with all this information. Of course! I want to make sure anyone can learn to make astrophotos! Thanks for the info. I was in Yosemite this past weekend. My photos are still sitting on the camera, but I want to make sure I am doing the right things from a processing standpoint. Very helpful. Great information- Thank you! Can you give any tips in regards to how one goes about shooting the milky way with something in the foreground? (ex. tree, house, etc). I guess two photos need to be taken, one focusing in on the foreground item and the other focused on infinity (or close to it). Is this correct? How does one mesh the two together? Brian, I’m currently working on a post for just that. You can focus pull a shot and blend, but usually it’s easier to pick one or the other. That, or make sure your foreground object is far away enough. With a wide enough lens, your foreground objects don’t need to be too far away to also be at “infinity” focus.